The following remarks were delivered by Alyssa Bickoff ’07 (Young Alumni Chair) at a celebration honoring faculty and staff, including the occasion of Nurit Kussell’s retirement after 26 years teaching at Schechter. 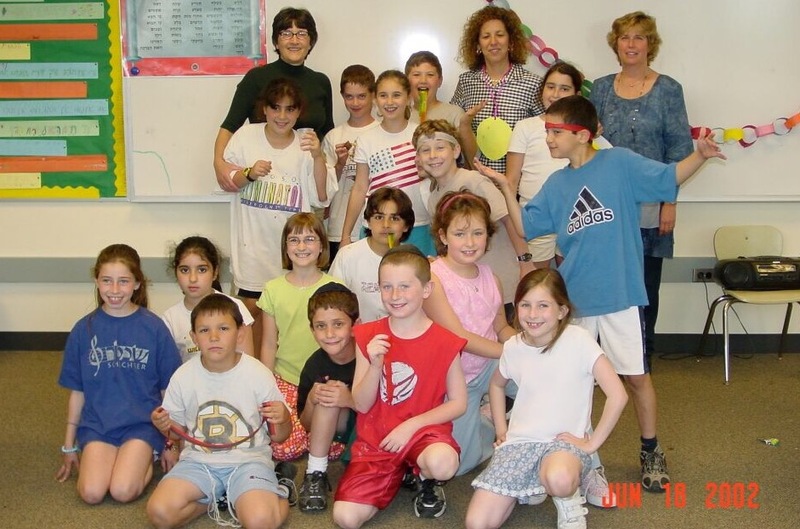 Pictured above: Alyssa’s third grade class with Nurit in June 2002. 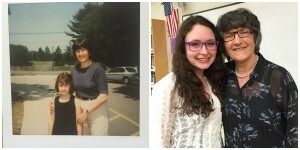 Pictured below: Alyssa and Nurit in 2001 (left) and at a celebration honoring Nurit in June 2016. There comes a time, hopefully, in every student’s life where an individual teacher makes an impact that helps direct them in their future journey. Nurit was that teacher for me. I have a love for the Hebrew language, solely because I was lucky enough to have Nurit twice, for 2nd and 3rd grade. While you find might it funny that someone could make such an impact on a child, at that young age, I’m proof that it can. Nurit was tough and loving all at the same time. She worked diligently with each student, bringing out their potential and encouraging them at every step. I loved learning from her so much that I actually met with her weekly, not for extra help, but instead just for extra learning. We read books in Hebrew and worked on my writing and grammar. I always say my Hebrew grammar is better than my English grammar thanks to Nurit. I continued my studies all the way through college, testing out of the language requirements, and taking all higher level courses where some of my classmates were teachers from the surrounding Jewish day schools. I am confident that I would not have made it to that level without the support I got from Nurit at Schechter. I know I am not alone in wanting to stand here to share my respect for what Nurit has given me and to publicly thank her for her many years of giving of herself to all the students who have been lucky enough to have her.